Just in time for Food Allergy Awareness Week (May 13-20), here is the essential list of reading and graphics to help educate yourself and others. Post these in your social media feed, forward appropriate articles to school and camp, and print graphics to hang up in school and elsewhere. In advance of Food Allergy Awareness Week, Healthline has published its annual list of the year’s top allergy blogs. Each blog offers a unique perspective and serves as a great resource to food allergy patients, their families, and their communities. I am honored that Allergy Shmallergy has once again made this list! Check us and the rest of the winner out here: Healthline Best Allergy Blogs of 2018. Passover is almost here! The 8 day celebration is a favorite celebration for a great reason: in commemorating the story of Moses, it honors freedom everywhere. Modern day Jewish people refrain from eating leavened bread to reflect on the Israelites’ quick flight out of Egypt and their perseverance through the desert. Given the restriction on yeast, many Passover recipes weave matzoh crackers or matzoh meal and eggs into delicious and inventive meals. But of course, if you’re allergic to wheat or eggs, this holiday can be challenging. And finding safe products poses a problem for those who wish to observe the holiday and participate in the traditional Passover dinner, called a seder. Thankfully, companies have begun to take note and gluten-free Passover products are MUCH easier to find today than they were when my son was first diagnosed with a wheat allergy almost 12 years ago. From matzo crackers to graham crackers, creamy chicken soup to the ever-essential matzo ball soup, and desserts galore, gluten-free alternatives are finding their way onto shelves in supermarket and are available for shipment online. Egg is often used more often during Passover to lighten dishes and replace traditional leavening ingredients. But what if you are allergic to eggs? Kugel, gefilte fish, matzo balls, and matzo brei are all held together with egg. Not to mention desserts?! 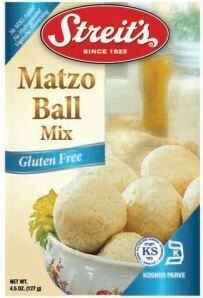 Of all the Passover recipes, matzo ball soup (a year-round favorite as well) is the most loved. And, the hardest to recreate without eggs. Enter aquafaba [read more about aquafaba here: “Okay, I Give… What is Aquafaba?”, Oct. 2016]. In trying to recreate your favorite Passover recipes, remember that you can use aquafaba, banana, tofu or apple sauce in place of eggs depending on taste and method of preparation. A huge THANK YOU to Rachel Alexandra of the fantastic blog, Roots, for nominating Allergy Shmallergy for the Brotherhood of the World Blogger Award. What an exciting way to round out a crazy week! 1. What is your biggest regret? That’s a tough one. One of the things I regret is not taking more time to travel before I had kids. I’ve lived overseas multiple times and really enmeshed myself in local culture. But I’d love to have spent time in Africa or South Asia while I was living relatively nearby. I guess the kids will have to pack their bags because I’m not done roaming! 2. What is something that your younger self would be most proud of about you? Great question! Hm… I think my younger self would be proud to know I’ve been bold about pursuing my passions. For example, when I was younger, I wanted to be a writer – now look what I’m doing! 3. What is your favorite fruit and why? (I love these questions!) Raspberries and summer ripe blueberries are irresistible to me. And, it’s hard not to DROOL over kiwi. Hairy on the outside and sweet, emerald deliciousness on the inside… Mmmm…! I used to play the flute – and wish I had played for longer. But I still play the piano! Now, I just wish I could sing (at all) and play at the same time! Piano takes concentration! 5. What setting from a book or movie would you like to live in or experience? That’s easy! Willy Wonka’s Chocolate Factory. What I wouldn’t do for an hour in that edible room with the chocolate river! I started writing as a way to find a like-minded food allergy community to connect with. When you get any kind of diagnosis, you tend to feel alone in the world. When you can relate to someone else’s journey, it can sometimes take the stress out of your own. 7. What is something you’re looking forward to? There’s so much to look forward to over the next year! One thing I’m working on is getting my organization, AllergyStrong, up and running. AllergyStrong is an organization that revolutionizes food allergy information in education, psychosocial impact and advocates on behalf of all patients with food allergies, but particularly for those at-risk and low-income families who could use the additional support. 8. If job availability/money were not factors, what would be your dream occupation? A ballroom dancer! It’s harder than it looks and is so elegant when done well. I’ve taken ballroom dancing from the time I was about 10 through college. I’d also love to be a television/movie writer or a documentary film maker. I love storytelling and think very visually. 9. If you could start any charity, what would it be? 10. Name a skill you want to learn and why. I’d love to really learn how to figure skate. I always played around with it as a kid and never lost that amazing sensation of gliding and spinning on ice. It was invigorating! I’d also like singing lessons… Ooo, and horse back riding! Tap dancing… Speaking Italian… I’ve clearly got to get cracking; I have a lot to catch up on! Where do you get inspiration for your blog/writing? If there are past lives, who were you/what was your profession? What song brings back a strong memory each time you hear it?